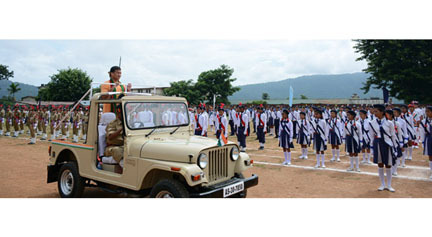 Along with the rest of the country, the 72nd Independence Day was also celebrated in Haflong, the district headquarters of Dima Hasao district and North Cachar Hills Autonomous Council (NCHAC), on Wednesday. Unfurling the tricolour on the occasion, Chief Executive Member (CEM) of the North Cachar Hills Autonomous Council (NCHAC), Debolal Gorlosa addressed the people of Dima Hasao at the Assam Rifles playground in Sarkari Bagan, Haflong, where the I-Day was centrally observed. On the occasion, the chief guest and the other guests offered floral tribute to Mahatma Gandhi before the beginning of the programme. Gorlosa was accompanied by Dima Hasao Deputy Commissioner Amitabh Rajkhowa and Superintendent of Police Prasanta Saikia on the dais. The district administration along with the help of various other departments organised the programme in a grand manner. Prizes were given away to the winners of various competitions held as a part of the pre-Independence Day celebration during the past few days. Under the the Chief Minister Samagra Gramya Unnayan Yojana, the Agriculture Department ceremonially distributed five tractors, out of 114 tractors, to the beneficiaries of the district. Rest of the beneficiaries will receive the tractors in a phased manner. Like other years, fruits and sweets were distributed among jail inmates, patients of Haflong Civil Hospital, orphanage by Deputy Director of Food & Civil Supplies and Consumer Affairs, Haflong. communities of the district like Dimasa, Jeme, Hrangkhol, Jaintia, Biate, Kuki, Assamese, Bengali, Manipuri, etc. Towards the end of the programme, prizes were distributed among the participants of the march past, cultural events so as to encourage them. Awards were also presented to the achievers in various fields such as best performing headmaster, safai karmachari, Asha worker, etc. Dima Hasao Bubli, the journal of the NCHAC, published by the Department of Information and Public Relations of Dima Hasao, was distributed to everyone present on the occasion at Haflong and Maibang. Two books, published by the department, were also released by CEM Debolal Gorlosa. The released books are ‘History of the Dimasas & Other writings of S.R. Thaosen’ by Vandana Thaosen and ‘A brief account of the tribes of Dima Hasao Assam’ by Ramdina Lalsim. The programme was attended by MLA BB Hagjer, Executive Members and other members of NCHAC, officers and staff members from 22 Sector Assam Rifles, 43 Assam Rifles, Assam Police, various departments, departments under council and district administration. In the sub-division level, the I-Day was celebrated at Maibang in a grand manner with people from surrounding villages witnessed the programme. Sub-Divisional Officer (Civil) NK Debnath unfurled the tricolour accompanied by Sub-Divisional Police Officer Mayank Kumar were present at the I-Day programme. The programme was held at Dishru field in Maibang where hundreds of people were present.